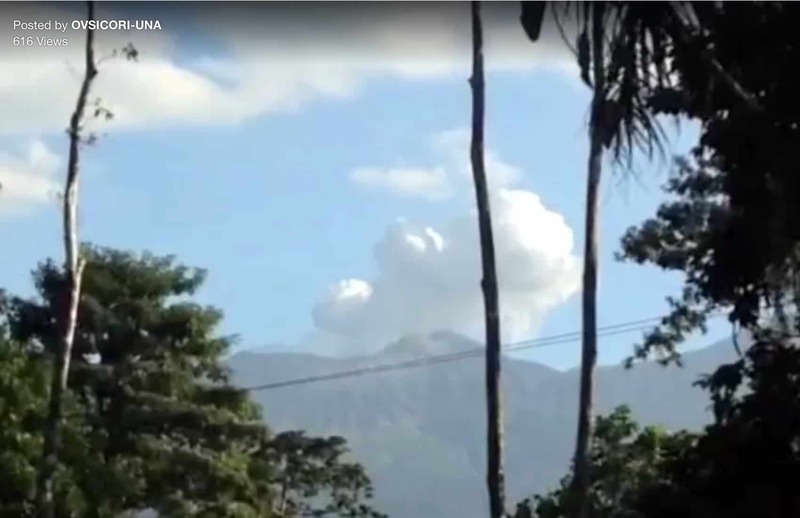 The Volcanological and Seismological Observatory of Costa Rica (OVSICORI) on Tuesday evening posted a video of a new eruption at Rincón de la Vieja Volcano, located in Guanacaste province. The explosion was recorded at around 4:20 p.m. by OVSICORI experts and was similar to those registered earlier this month. The video shows a column of vapor and gases reaching more than 700 meters high, OVSICORI stated on its Facebook. Volcán Rincón de la Vieja. 15 de marzo 2016. Como indicamos en el informe publicado el pasado viernes 11 de marzo, desde finales del 2015 la actividad freática del Volcán Rincón de la Vieja ha venido en aumento. ( https://www.facebook.com/media/set/?set=a.967308816639710.1073741848.106757629361504&type=3) este video tomado por Mauricio Gutiérrez nos muestra una erupción freática, con una columa compuesta mayormente por vapor de agua y gases que supera los 700 metros de altura, esta fue registrada alrededor de las 16:20 de esta tarde. Local residents on March 9 told OVSICORI that ash had fallen on the roofs of their homes in an area of six kilometers around the volcano, mainly in communities north of the crater in Upala and Buenos Aires. Rincón de la Vieja, located 270 km northwest of San José, had shown low activity in the past 15 years. OVSICORI reported that ash, mud and vapor explosions intensified last year. Inspections in recent months found that material from explosions mostly fell in the area surrounding the crater, and some fell on rivers located north of the volcano. Access to the Rincón de la Vieja National Park is open to the public, but officials from the National System of Conservation Areas warned visitors to avoid the crater’s surrounding area.